Try bank fishing at Ira Bea Oasis Road off CR 138 and in Ginnie Springs. 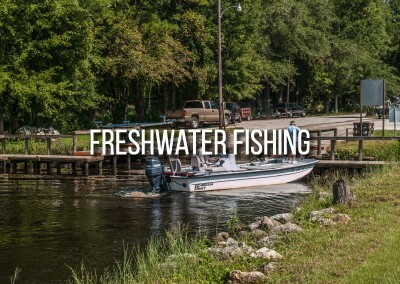 Both Suwannee bass and largemouth bass offer excellent fishing opportunities. A large population of redbreast sunfish provides the best fishing the river has to offer. Try fishing for this species near fallen trees or stumps. Largemouth and Suwannee bass are abundant and both species can be caught along the shoreline near fallen tress or stumps. Redbreast sunfish and spotted sunfish are the most abundant game fish in the river and are easily caught near shoreline brush and stumps. The peak season is May through September.